If you are unhappy with your aging skin, or if you are looking to reduce the appearance of scars, pore sizes, or stretch marks, but don’t want to undergo invasive cosmetic surgery, there are other effective treatment options available. Fine lines, wrinkles, deep, depressed scars and more, can often be plumped without anesthesia, incisions and long recovery times. What is Dermaroller micro-needling in Midlands? Micro-needling with a Dermaroller in Midlands, also known as collagen induction therapy, is a non-surgical skin rejuvenation procedure that may help to repair the skin’s surface. This treatment involves tiny medical grade needles used to puncture the deep layers of skin and create controlled damage. These punctures may trigger the body to produce new collagen and elastin to fill the tiny wounds. Blood flow increases to the area as healing begins and collagen may increase below the surface of the skin. How does micro-needling improve damaged skin? After the first Dermaroller treatment, so much happens beneath the surface of the skin. Instantly, the body’s natural healing response kicks in once the injury occurs. Improvement is usually seen gradually with repeated Dermaroller sessions. This rejuvenating process may last for up to a year. Skin needling aims to encourage your skin’s natural healing mechanisms, which may stimulate new collagen growth, improve the tone and texture of skin, and reduce the appearance of scars and wrinkles. 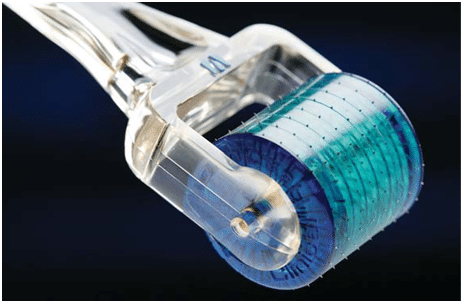 What happens during the Dermaroller procedure? Dr. Victor Sagoo performs safe and effective Dermaroller treatments at The Solihull Medical Cosmetic Clinic in Midlands. Before treatment begins, a topical anaesthetic cream is applied to numb the desired area. The Dermaroller is then applied to the skin that needs to be repaired and restored. The micro-needles break through the skin causing tiny degrees of trauma and inflammation. The treatment session takes about one hour with minimal discomfort and little to no downtime. How soon will the results of the Dermaroller treatment be noticeable? Dr. Sagoo uses this procedure to treat patients with age related skin damage, too much sun exposure, pigmentation problems, stretch marks and acne scars. However, micro-needling is most effective against fine lines and wrinkles. Results are usually noticeable in the first few weeks as the skin gradually begins to look brighter. Over the next six months to a year, the skin may continue to become tighter and pigmentation may lessen. It generally takes a few months to see overall improvement. Can Dermaroller be combined with other cosmetic procedures? Dermaroller micro-needling treatment is very effective alone, but results can be further enhanced when combined with other cosmetic procedures. Dr. Sagoo offers combination packages that include Dermaroller treatment along with such other procedures as photo-rejuvenation, chemical peels, and microdermabrasion, which may allow you to achieve the best looking results. Is Dermaroller treatment right for me? Dermaroller micro-needling is a safe and highly-effective solution for all skin types. The cost of treatments depends on the required strength. For most patients, Dr. Sagoo suggests three treatment sessions at monthly intervals. He can meet with you at The Solihull Medical Cosmetic Clinic in Midlands to discuss the right treatment method for you. Contact Dr. Sagoo either online or at 0845 603 6150 for further information or to schedule your consultation.